This homemade blueberry buckle recipe is a keeper. The flavor is beyond words and it's easy to make. I really enjoy these fruit desserts in the summer. To me, it's more like a coffee cake and that's what I drink with it - coffee. Why do they call it buckle? It's when fruit is added to the dough and topped with a sugar/flour streusel on top. It's also known as Blueberry Cobbler, Blueberry Crumble and even Blueberry Betty. 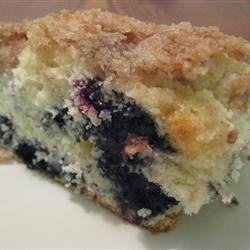 If you have some blueberries, you MUST make this homemade blueberry buckle. More easy blueberry recipes at the end of the page. Sprinkle streusel evenly on top of the cake and bake for approximately 55 minutes, or until deep golden brown and toothpick inserted in the center comes out clean. Let sit and cool for 15 minutes if you want to serve it warm. Cut into wedges and serve (or in my case devour). For a real treat, you may serve this buckle warm with a healthy scoop of homemade ice cream. I have more than just a homemade blueberry crumble recipe, more dessert and fresh blueberry recipes below. Check them out.